I’ve surveyed the audience and one thing is clear: when it comes to running a coaching business, it’s REALLY nice (some would say downright essential), to have a clear separation between getting paid for coaching work and doing said coaching work. One invariable muddles the other: blessed is the coach who outright won’t tolerate clients who would make them chase checks, and it’s really nice if the client doesn’t get distracted with logistics of paying for business, life, or health coaching when they’re heads down getting the most out of a coaching experience. CoachAccountable makes this possible. All you really need to do is set up your coach portal to process client invoice payments on your behalf, by connecting it to your Stripe or Authorize.net merchant account. If you don’t have one yet, CA makes it super easy to grab a Stripe account in about 5 minutes. Once ready, you or your client can enter a credit card up front, have it stored for future charges, and CA will automatically process invoices on whatever schedule you like. 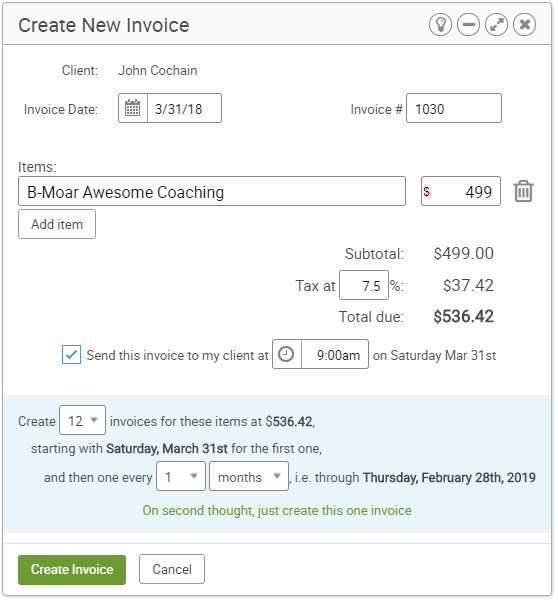 CoachAccountable coaching client invoices are super simple to create. Just add a date (or default to today), enter one or more line items (with associated prices), add taxes if needed, and you’re done. 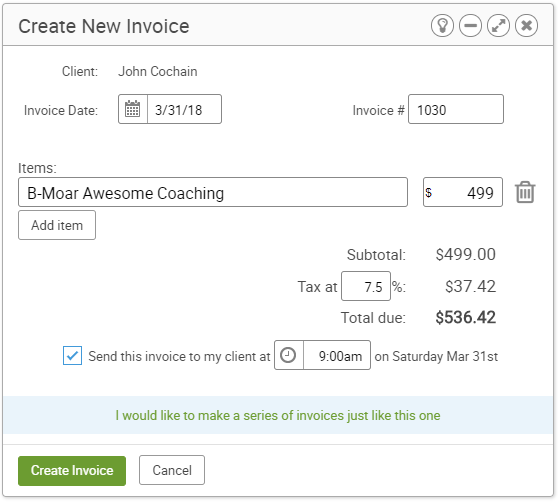 Check a box if you want CA’s coaching management platform to email it off to your client, either immediately or as scheduled (when entering in a future invoice). Be MOAR awesome? Oh yeah, sign me up! 12 invoices, one every 1 month… sounds about right for a year long engagement! A whole bunch of ostensibly pending revenue… nice! These invoices will be sent off via email to your coaching client, right on schedule throughout the coming year. What happens when an invoice’s date comes up? That depends! If your client doesn’t have any credit card on file, the invoice email he/she gets will contain a magic link. Clicking that will take them right to a page they can enter their credit card in order to pay the invoice. In our scenario so far, your client is apt to get sent that first invoice as unpaid, and they’ll need to enter their payment info the first time and then (hopefully) opt to save their payment info on file for seamless processing of future invoices. But perhaps instead you’d like to set them up from the get-go. You as coach can do that for them, provided you have their credit card information (perhaps from some form they filled out, or perhaps when they handed it to you during an initial in-person meeting and you’ve got your swanky tablet there and ready to set things up). Holy moly this invoice is overdue. Let’s click that first option and get this all handled! Remember this card for future use? Yes please! Simple as that. 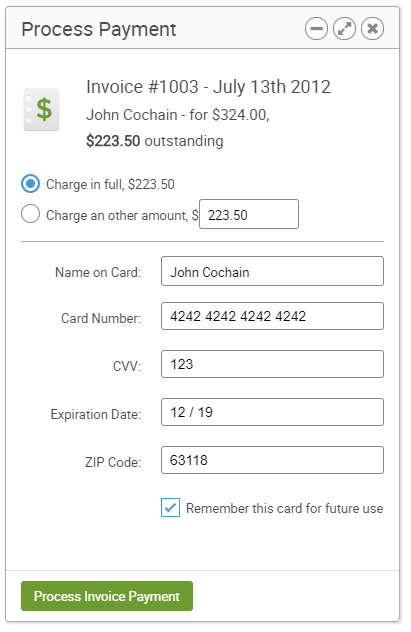 By remembering the card for future use it will be handy for automatically processing future invoices. By either you or your client entering that credit card once when you’re first getting started, everything else takes care of itself with the subscription billing you set up to cover the term of your coaching engagement or program. Nice! Is this secure for my coaching clients’ sensitive payment info? Sounds pretty good, any fees for this? Nope! You’ll almost certainly need to pay the usual fees endemic to ANY credit card processing, but CA doesn’t take any cut whatsoever. Having to play the role of accounts payable is seldom pleasant, and most certainly distracts from doing the real difference-making work of coaching. 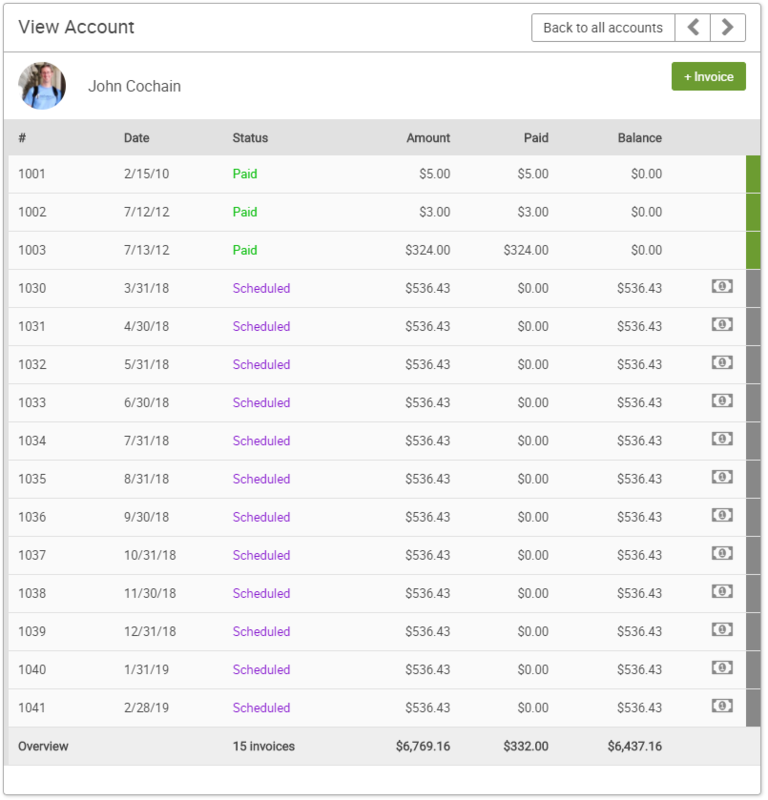 Use this setup to get coaching client payments handled without hassle from the get-go, and automate away the drudgery of chasing down (and even processing!) payments later. Enjoy! 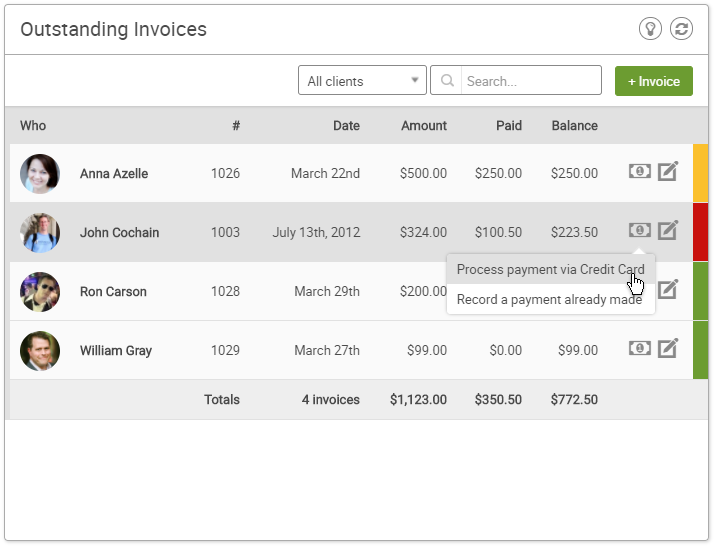 Ready to finally have your invoicing sort itself out in a way that you can easily share with your accounting team? Try CoachAccountable. It’s free for 30 days. To clarify, I currently use Stripe’s subscription option to automatically charge my clients’ credit cards so that I don’t ever have to think about it. Are you saying that this option would replace that while still using my stripe account? I like the idea of having it all in one place. I assume that both they and I can always see what payments are coming up…? Close! Stripe Subscriptions support indefinite recurring charges, whereas in CoachAccountable you need to generate a series of invoices (which is finite). You as coach within CA can see all future/scheduled invoices, but they are not visible to your clients until sent on schedule. John, can you do subscription billing through Paypal. Or does it have to be Stripe? This is supported for only Stripe or Authorize.net. Stripe now processes other European payment methods like Bankcontact, IDeal,…. Does this mean that we can apply the method of adding a Belgian Card like Bankcontact (belgian) to CA? If a client pays me $100, how much of it will show up in my bank account? Great question! And that’s actually one that’s entirely up to your payment processor. CoachAccountable doesn’t take any cut, so the only transaction fee is whatever you have set with Stripe or Authorize.net. Par is something between 2.5 and 3% + something like 30 cents per transaction.